Absolutely mammoth late Victorian white ironstone banded jug. Exceptional Survivor considering its size and use. Weighs just over 4kg empty. Largest I have ever had. Very clean and unstained, great design with handy shell shaped carrying support to the front. 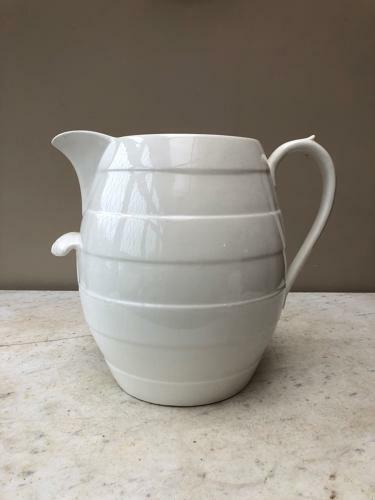 No chips or cracks to the spout or handle, but at sometime in its life it has been knocked at the front and there is a small circular knock to the glaze and associated hairline next door. The jug is so big and thick is hasnt gone through - it is just a surface knock and you can see from the photographs when angled sideways not noticeable...it is there though. Inside there are two hairlines which dont show on the outside and when turned over a chip which doesnt show when the right way up.